It's almost Thanksgiving time. Here are some fun puzzles, activities, and worksheets you can use with your class. Cut out the turkey pattern and the feathers. Write on the feathers. Glue them on the turkey's body. Play Thanksgiving Bingo with your class! Students cut and color the Thanksgiving pictures, then glue them onto the bingo board. 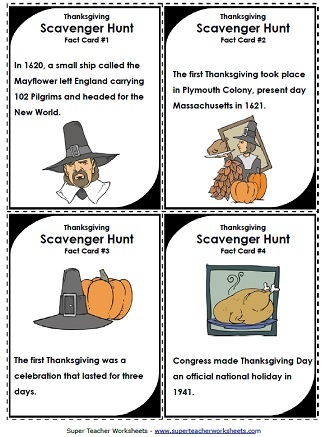 Hide Thanksgiving facts around the classroom. Challenge your students to find the hidden facts and use them to answer questions. Here's a fun hat/crown craft. Color the turkey, cut it out and assemble the crown. Then wear it around the school. Cut and fold this cootie catcher craft to make a Thanksgiving turkey! Build a diorama scene that depicts the first Thanksgiving dinner. Students cut and glue the Native Americans and Pilgrims onto the scene. How many words can you make from the letters in the word THANKSGIVING? This worksheet has primary-ruled lines for students in grades K through 2. How many words can you make by rearranging the letters in the word THANKSGIVING? This worksheet has a scoring system and was designed for students in grades 3 through 6. Your kids will love coloring the Pilgrim and Native American at the top of this calendar worksheet. Use this turkey paper to write Thanksgiving stories or poems. Solve this Thanksgiving cryptogram picture puzzle to decode a secret message. Find the hidden words: turkey, Pilgrim, Native American, stuffing, Mayflower, and more. Students can read the Thanksgiving clues and fill in the words on this criss-cross puzzle. Students can color, cut, and assemble this Thanksgiving-themed mini-book. Then they count the objects on each page and write the amounts. Then read the book. Cut out the words and arrange them into a complete sentence. Then write the sentence and draw a picture. The sentence reads, "Do you see the turkey?" Cut out the word cards. Arrange them into as many complete sentences as you can. Most words are basic sight words, such as: our, me, the, see, you eat. Some words have a Thanksgiving theme, such as turkey, ate, pie, roll, corn. On this printable graphic organizer, students write about the things they see, smell, hear, feel, and taste on Thanksgiving Day. Ivy's Mommy, Grandma, and Grandpa are busy in the kitchen, preparing for Thanksgiving. Ivy wants to help. What can she do? Molly is convinced that her Thanksgiving is ruined when the electricity goes out. No turkey, no stuffing, and no pumpkin pie. But when she finds a neighbor in need, Molly discovers a new meaning to Thanksgiving. 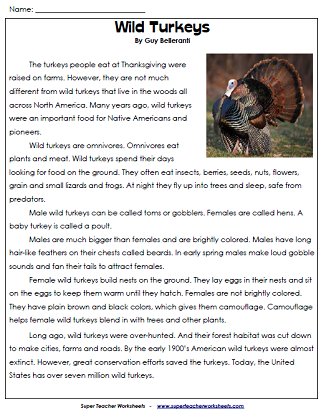 Learn all about wild turkeys, including what they eat, where they live, and how they sleep. Leslie has to write a report on what she's most thankful for this Thanksgiving, but she can't decide on one thing. But after spending the holiday with her family, she knows exactly what she'll write about. This informative article compares and contrasts Thanksgiving in the United States to Thanksgiving in Canada. Approximately 3rd grade reading level. Read about the lucky turkeys that have been pardoned by American presidents throughout history. Read about the 9,000-year history of pumpkin pie. Approximately 4th grade reading level. Discover why Benjamin Franklin thought the wild turkey would be the ideal bird to symbolize America. Approximately 4th grade reading level. Kids will enjoy this fun poem about a child who befriends a turkey on Thanksgiving. The turkey is holding up a sign. Write words in the sign, then explain the picture. A turkey, dressed in a bib, is holding up a knife and a fork. Write a Thanksgiving story to explain why. A turkey is holding up a sign that says "Vegetarians-R-Us." Write a silly story to explain the illustration. 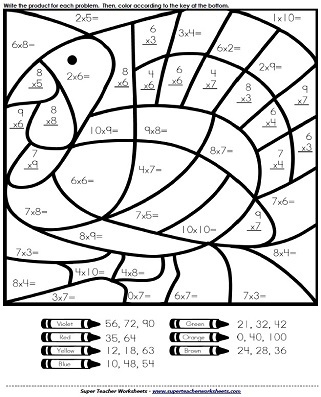 Write the answers to the addition math facts and color the Thanksgiving turkey according to the key. Find pairs of numbers that add up to twelve. These game boards have a Thanksgiving turkey theme. Adding problems with 2-digits; Requires regrouping; Thanksgiving turkey pictures. Students can cut out pictures of Thanksgiving foods from a grocery store ad paper. Then add up the prices to find the total cost of the items. Write the answers to basic subtraction problems and color the Thanksgiving turkey according to the key. 2-digit with regrouping subtraction problems inside of turkey pictures. Find the sums and difference. Then, color the cornucopia. Includes two word problems about Pilgrims. Solve each multiplication problem. Then use your answer and match it to the color key and color the picture to solve the mystery picture. Multiplication problems; 2-digits times 1-digit; Thanksgiving pictures. 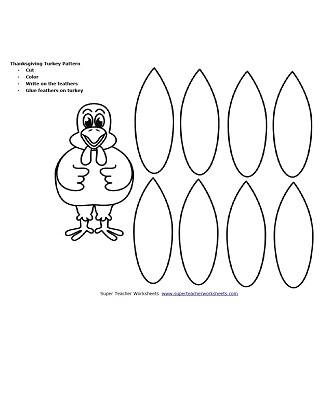 Write the quotients, then color the mystery picture to reveal a Thanksgiving turkey. 1 and 2-digit quotients, all problems have remainders; Thanksgiving turkey pictures on the page. This worksheet has basic Thanksgiving-themed word problems for 1st and 2nd grade students. This printable sheet has math word problems for 2nd and 3rd graders. Skills include adding and subtracting numbers with 2, 3 and 4 digits. These word problems were written for 3rd and 4th graders. Skills include multi-step problems, fractions, division, and subtracting money. This math worksheet features Thanksgiving word problems for 5th and 6th grade students. Skills include 3-digit multiplication, long division, fractions of a group, and multi-step problems. Keep track of student rewards, reading, or homework assignments with this sticker chart. Here is a complete unit with Thanksgiving spelling words. Includes a word list, ABC order activity, puzzles, and assessment resources. Here's a Thanksgiving spelling unit for second graders. Word list includes: dinner, roll, turkey, pie, fork, plate, knife, thank, butter, and corn. This page has several spelling worksheets (approx. 4th grade level). There's a Thanksgiving word list, spelling puzzles, and an ABC order activity with a Thanksgiving theme. Here you'll find the 5th grade Thanksgiving spelling list, along with worksheets, puzzles, and a test form. Printable Christmas crafts, worksheets, puzzles, reading comprehension passages, and math worksheets. Print out the Veteran's Day game, word search, and reading comprehension story. Printable puzzles and worksheets to use during the fall months. This page has printable crafts, activities, and worksheets for teaching students about Native American history and culture.